The Cleaning Booth is a safe and effective means for removing, extracting and collecting residue from people. It is particularly effective for cleaning employee’s dirty work clothes without exposing them, co-workers, or their work environment to elevated dust levels. The Cleaning Booth is a self-contained air shower incorporating the JetBlack personnel de-dusting system which delivers a high volume of air at low pressure, sufficient to remove dust and fibres effectively and safely, even when directed at exposed skin. 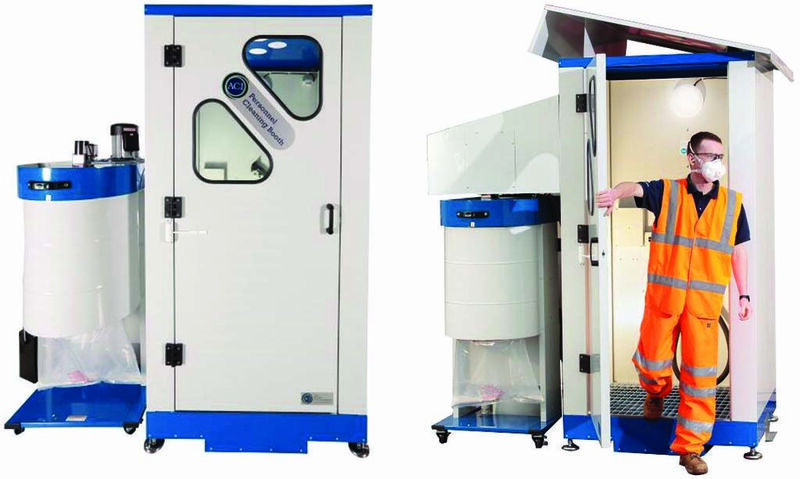 The main advantage of the Cleaning Booth is that workers, without removing clothing/PPE equipment, can simply enter, operate and clean themselves down very quickly. Typically, within approximately 20 seconds, most visible traces of any dust will be removed from clothing. The airflow produced by the JetBlack dislodges even hidden dust which is then captured and filtered within the extraction unit. Any dust removed can be either collected in bags in dust receptacles or ducted into extraction systems. Get an overview of our spare parts and accessories for Jetblack products and the cleaning booth.